This article appeared in the North Island Gazette January 29, 2015. When many of the first non-First Nations people came to the North Island in the late 1800s, they were attracted by the offer of preemptions of land. If a man or a family (rarely a woman) would come and clear the land, build a house and live on it, they would get title to the property. This was the government’s way of encouraging people loyal to the British Empire to populate the hinterland of coastal BC. Homesteaders found that it was difficult to make a living farming in the North Island’s coastal rainforest, and in order to make money many people turned to prospecting. In the late 1800s, the government would test mineral samples (assays) for free, and so boat-loads of local men would venture off into the great unknown for days or weeks at a time, looking for evidence of precious metals. Residents of Quatsino seemed to be particularly adept at finding these deposits. One of these successes was the discovery of copper in an area by Elk Lake (now known as Benson Lake) in about 1897 by George Nordstrom. A claim was laid called the “Old Sport Mine” in an area about 500m south of the river on the lake. In the early 1900s some surface work was likely done on the claim. 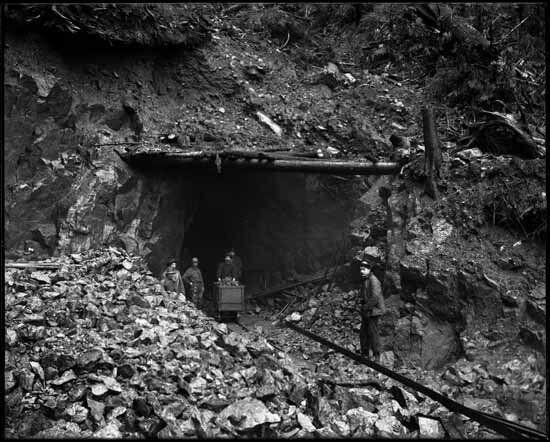 The mine used diamond drills to a depth of about 400 feet. They ran a water-driven generator plant, and had a camp for about 30 employees. In 1916 mining giant Cominco purchased Old Sport and a number of other claims in the area. They started the work of constructing underground shafts to mine below the surface. They changed the name of the original Old Sport Claim to Coast Copper. To get supplies to the mine materials would be offloaded from the Coastal Steamships in Port Alice at Jeune Landing, driven to Alice Lake, boated across the lake, taken by pack horse to Kathleen Lake, boated across the lake, and then again taken by pack horse to Elk (Benson) Lake. Many local men worked at the mine up until the 1930s, when the Great Depression halted production. In the 1960s mining in the area was reactivated. The main minerals produced were magnetite, chalcopyrite and local bornite. 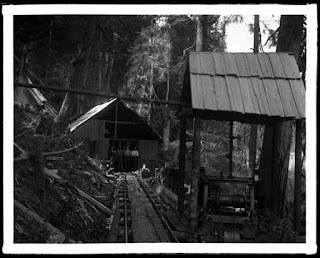 The mine produced iron, copper, gold and silver. During a ten year production run more than 2.5 million tonnes were mined from the site. Many of the tailings were dumped into Benson Lake. About every ten years a new company expresses interest in the site. In the late 1960s it was Quatsino Copper Gold, in the 1970s Alice Lake Minerals, in the 1980s Taywin Resources, in the 1990s Noranda Inc. The claim has been for sale again in recent years as a part of the Merry Widow Group. Photos show one of the old mine shafts from the Coast Copper claim in the area by Chris Halliday www.250explorer.com . Interesting...As a youth of 17, I worked at the mine in the summer of 1965. The nearest town was Port Macneil, and road access was via logging roads...dodging logging trucks all the way...to get to 'civilization'...at Campbell River....and down to Nanaimo or Victoria. We used to go swimming in Benson Lake, a short walk from the camp. Great articles, I was raised at Englewood and Beaver Cove. I worked at Benson Lake in 1970/1971. Whar I remember was the sun didn't come up until 11:00 am and disapeared at 1:00 pm. It seemed to be always cold there even in summer and incredibly wet in the winter. My father Francis Arthur Jones worked at Benson lake mine from 1963. I have his original union card and several photos of the mine. Hi Vincent - we would love to share some of your photos of the mine if you are interested! Is your name Heather and you are writing the story of your family's history in relation to their life in Strandby many years ago?I'm interested because my family roots go back to the other side of the northern tip of Vancouver Island - Cape Scott and the danish settlers there. I'm not sure if I have the right person. If so, please reply to me. Hi Heather - I am the author of this website, my name is Brenda. I'm not sure who was looking for information on Strandby. I worked at Benson Lake Mine through late fall of 1968 through spring of 1969. Came across this article and found it interesting.